In the morning, after a delicious breakfast cooked by the team chefs, we ran down the hill to meet with the children again. We taught them some English while they taught us some Nepalese. After that we all sat on top of the hill for a while in awe of the sight before us. Once their morning break was over and they were back in class we began securing provisions. Such as paint, rollers and brushes. Initially had the job of painting the high parts (As I’m 6’3 which made me a giant to the kids). As someone interested in art, Sophia was chosen to paint a mural of an elephant on the front of the school. However she needed an assistant and chose me to help her. I felt so happy that she chose me over everyone else and as we began to paint the elephant together we talked for hours on end. 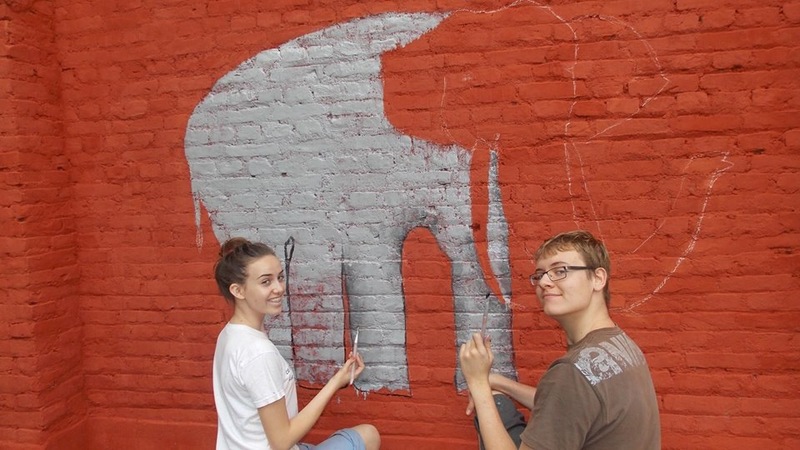 Over the next few days Sophia and I worked on the elephant mural on the front of the school, as we painted we got to know a lot about each other, we shared stories laughs and eventually had a paint war. 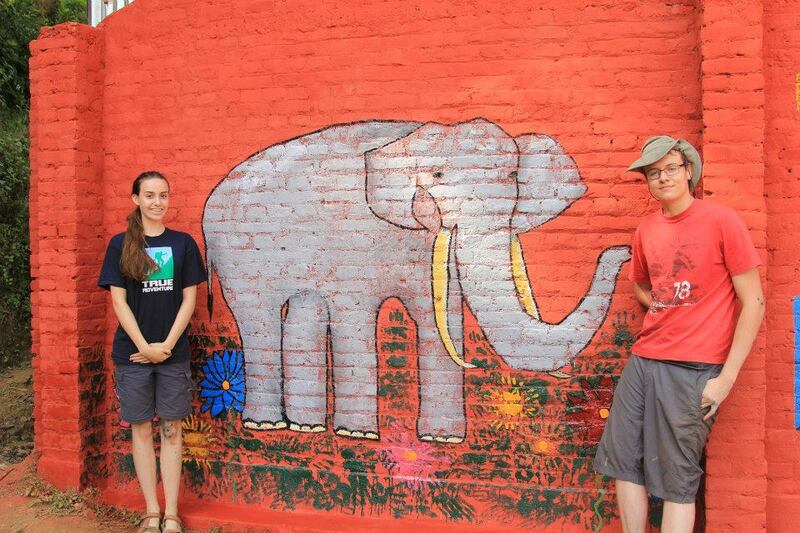 (We dated for two and half years after that trip and had some great times together) Towards its completion, the rest of the team pitched in to make it one of the best elephant murals ever! The rest of the school was painted a light shade of red which seemed to suit the building. In the evenings after painting, it was time to have some fun. I grabbed my camera and began taking photos. The kids were amazed by it, they had never seen a picture of themselves before so when I showed them what they looked like, it was both hilarious and awe inspiring for them. Everyone in the village seemed to want their photo taken and I was more than happy to be the one taking them. After a massive photo-session we sat down to watch a few of the older village children play football against some of our team. After a few days it almost became a ritual, sometimes we would win and sometimes they would but it was all good fun regardless of who won. Then when we were all done with the football we’d run up the very steep hill to our camp site and have a Tibetan hand cooked meal (which is still among the best food I’ve eaten to date). Once we were all done painting, it was time to present each child of the village a gift. These included tennis balls, colouring books, pencils, pens and bubbles. I recall I gave one girl a silk scarf; she played with it for a while then came and found me to give it back. I said ‘no it’s yours now’, I’ll never forget the look on her face as she realised it was a gift. I also remember seeing one of the older girls in the village experiencing the wonder of bubbles for the first time. It reminded me that it’s the little things in life, that can make a big difference. That night the whole village lit a fire by our camp sight and sang songs to praise us for our efforts and gifts that we donated to the village. It was great to sing and dance with everyone, certainly an experience I won’t soon forget. The day after we handed out the gifts, it was time to pack up our campsite and head off to Chitwan National park! After a lengthy 5 hour mini bus ride along the mountainous roads, we arrived at Chitwan, which is one of the largest national parks in Asia. Once we arrived we were reminded to make sure everyone was taking their malaria tablets and were equipped with mosquito spray. After the formalities were out of the way we rushed on to the streets of Chitwan to see the sights that it had to offer! We started by walking away from the hotel looking for adventure. After a while we stumbled across the place where the elephants of Chitwan are housed and taken care of, I’ll never forget this one cheeky baby elephant and its mother. 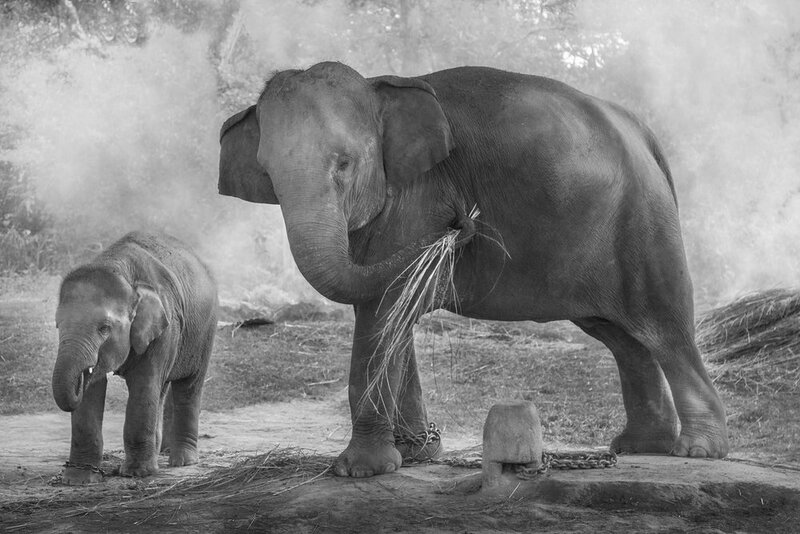 They were so full character and emotion, the young elephant showed the excitement and inquisitive nature that children do. After spending a lot of time observing the elephants, we kept walking around Chitwan. This place was amazing! There were people riding elephants through the streets. One thing that surprised us was seeing packs of wild dogs roaming the streets and forests in search of food. It really opened my eyes to how different each environment can be. We then looked around a few shops; I bought a Nepal style Knife to hang to my wall, as well as gifts for loved ones back home. Once we were done shopping we went back to the hotel for dinner, I distinctly remember me and my friends trying an orange sauce with some rice. We all tried it at the same time and it was nice until the heat hit us. It was still some of the hottest food I have had to date and thinking about it makes me crave a glass of ice water. After dinner, some of the other guys and I bundled into a room and played a few games of cards. It was a great first day in Chitwan. The next day we were all set to go on an elephant back tour through the jungles & forests of Chitwan national park. Our guide told us that we may see wild monkeys, birds, deer, rhinos and even the illusive Bengal tiger! This filled us with excitement. As we arrived we could see how we were going to be getting onto these amazing animals. We had to walk up these wooden stairs onto a high platform, where the elephants would stop so we could step onto their backs. They’re such friendly creatures. Once four people were on an elephant, the tour began. I remember holding my camera, ready for anything. We saw the amazing jungle that Chitwan had to offer as well as some wild boar, deer and a few monkeys, although unfortunately we didn’t see any tigers. After our elephant tour, we were straight off to our next activity. (A hollowed out canoe ride) I was particularly excited, as this was an opportunity to get some more animal shots, in a completely different environment. As we arrived at the river bank I recall being shocked at how long these canoes were and how low they floated on surface of the water, this made a few of the team particularly nervous as we could see crocodiles in the water. Once we floated up river we saw more of the amazing wild life that Nepal had to offer. Including a huge number of bird species, fish and many…many crocodiles…(gulp) although intimidating it was an amazing experience to photograph crocodiles in their natural habitat. After about half an hour or so, the canoe ride was over and we went on a nature walk. It was exciting to walk through the jungle and experience a completely different side to Nepal. I would say that the highlight of the walk was seeing a wild rhino up close in its natural habitat. The entire group felt exceeding happy to have seen such a rare sight. The next morning we set off back to Kathmandu for one more day before we were set to depart back home. After another lengthy mini bus ride we arrived in Kathmandu and felt rather drained. However we all decided we would go out and explore the streets, to get the most out of this rare and amazing adventure. We followed the bright and colourful lights into strange and wonderful shops. After our final shop, our team went for our last meal at Rum Doodles, the restaurant which many people go to after scaling Everest. I ordered a yak steak and chips. It was so rich, one of the best steaks I have ever had. It was the perfect end to a trip that I will never forget as long as I live. I took so much from the trip as well, including; a new understanding of different cultures, a broadened respect for people less fortunate than myself, a new passion for travel and the urge to help people who need it most.